You are buying a new HO 1:87 Herpa # 53723 - 5th Wheel Assembly (20 pcs.). THESE UNITS HAVE SMALL PARTS AND ARE FRAGILE. TRUCK STOP HOBBIES CAN NOT ANTICIPATE THE COST OF THESE FEES AND IS NOT RESPONSIBLE FOR THE FEES. NORSCOT #55134 Caterpillar 627G Wheel Tractor Scraper 1/87 PRICE REDUCED! NORSCOT #55134 Caterpillar 627G Wheel Tractor Scraper. 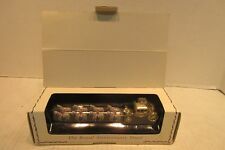 1992 Matchbox Models Of Yesteryear YY66 Her Majestys Gold State Coach 40th Ann. • Manufactured by Promotex. • Model #6580. Nicely detailed custom painted semi tractor 1/87 HO scale for an HO layout, or as a stand alone collectible model. • Scale/Gauge: 1/87 - HO. • Color: Yellow. • Walthers SceneMaster: Model #949-4165. • Camping Tents: Includes 4 small & 2 large tents. Nicely detailed collectible 1/87 HO scale accessory for an HO layout. • Scale/Gauge: 1/87 - HO. • Great detail for campgrounds, scouting events, back yard scenes and more. 1/87 HO scale 27' single axle semi trailer, with pintle hook to connect converter dolly and second trailer, white with gray roof, Promotex #5273 or can be painted any color you wish, made from quality injection molded plastic 1/87 HO scale, nicely detailed, manufactured by Herpa/Promotex, can be used to hook a set of doubles, see complete details below. International IH R-190 Tractor with 32' Sealtest Dairy Products Aero-Van "Reefer" Set. This International Semi-Truck & Trailer will add realism to your layout. • Trucks "N" Stuff: Model #94924. • Detailed chassis and undercarriage. • Tonkin: Model #94993. Nicely detailed semi trailer 1/87 HO scale for an HO layout, or as a stand alone collectible model. • Scale/Gauge 1/87 - HO. 2" long, nicely detailed, see complete details below. • Scale/Gauge 1/87 - HO. • HO built-up construction. • Trailer tongue with separate ball hitch, can be mounted to a vehicle. • NEW unopened in a plastic case. HO 1:87 SCALE SCENEMASTER 949-11920 INTERNATIONAL(R) 7600 2-AXLE CREW CAB BRUSH FIRE TRUCK NEW. CHECK OUT OUR STORE FOR MORE GREAT BUYS AND WE ALWAYS COMBINE SHIPPING. 1/87 HO scale 26' tandem axle gravel semi trailer with opening tailgate & tilting bed, make from quality injection mold plastic 1/87 HO scale, nicely detailed, manufactured by Promotex, model #5281, see complete details below. NICE tandem axle (dual axle) converter truck dolly with long drawbar, produced by Promotex. 1956 Dark Blue Ford F-100 Pickup New! This Vehicle will add realism to your layout. • Walthers SceneMaster: Model #949-4100. 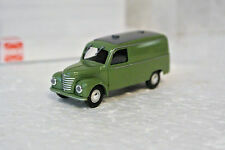 Nicely detailed collectible 1/87 HO scale accessory for an HO layout, or as a stand alone collectible model. • Scale/Gauge: 1/87 HO. • Color: Green. 2.5" long. Nicely detailed collectible 1/87 HO scale model for an HO layout, or as a stand alone collectible model. Busch small 2 axle utility trailer with mower, Orange, fully assembled 2 axle utility trailer from Busch is ideal for any layout, HO 1/87 scale, nicely detailed, Busch # 44932, vehicle size approx. 1.5" long. If the item is listed as new, its because we believe it is new. Interesting Volkswagen promo item. This Wiking 1:87 HO Scale model was built as a tribute to the German State of Saxony. Contains the official Saxony flag on the hood. From the Volkswagen AutoMuseum in Wolfsburg, Germany. 1/87 HO scale 3-axle grain trailer with double grain chute and simulated canvas tarp semi trailer, can be used as a 3 axle, tandem axle or spread axle, Promotex model #5446 white with blue tarp, or can be painted any color you wish, make from quality injection molded plastic, nicely detailed, manufactured by Promotex, see full details below. WIKING Vokswagen Touareg (Dark Blue) 1/87 HO Scale Plastic Model NEW, RARE! Made in Germany. 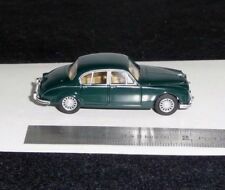 Highly collectible precision scale model in 1/87 (HO) Scale. Actual item on sale may display slight variations. The item is mint new and has never been removed from its original box. 1/87 HO scale chemical trailer, silver tandem axle trailer, Promotex model #5287, made from quality injection molded plastic, nicely detailed, manufactured by Promotex, see complete details below. 1/87 HO scale cattle trailer, Red Possum belly tandem axle, Promotex model #5356, made from quality injection molded plastic, nicely detailed, manufactured by Promotex, see complete details below. HO-1/87th Scale Busch 43416. 1952 Cadillac Red Limousine New! You are buying a new HO 1/87 Wiking # 38814 Krampe 20-Ton Half-Pipe Dump Trailer - Green, Black. THESE UNITS HAVE SMALL PARTS AND ARE FRAGILE. TRUCK STOP HOBBIES CAN NOT ANTICIPATE THE COST OF THESE FEES AND IS NOT RESPONSIBLE FOR THE FEES. Busch small single axle utility trailer, Gray, fully assembled single axle utility trailer from Busch is ideal for any layout, HO 1/87 scale, nicely detailed, red tail lights, mounted spare, Busch # 59942, vehicle size approx. Made in Germany. If there is a problem, we will take care of it! HO 1:87 Busch # 47623 Chevrolet Caprice - D.A.R.E. You are buying a new HO 1/87 Busch # 47623 Chevrolet Caprice - D.A.R.E. • 27' tandem axle (dual axle) semi trailer 27' tandem axle (dual axle) semi trailer. 1/87 HO 27' tandem axle (dual axle) semi trailer, white with gray roof, or can be painted any color you wish, made from quality injection molded plastic 1/87 HO scale, nicely detailed, manufactured by Herpa/Promotex model #4600000, see complete details below. Dodge Monaco Texas Cab New! MAN F 2000 refer semitrailer "Nordfrost", in PC display case, 1/87th (HO) scale (approx. Highly detailed injection molded plastic model with tilting cab m anufactured by HERPA --> high quality models with excellent details ! ). HO-1/87th Scale Busch 48200. 1950 Chevy Blue Pickup New!